That's a pretty stunning photograph, even if you're not familiar with the musical's original poster design, and suggests a level of intensity and grit that most people wouldn't associate with movie musicals. 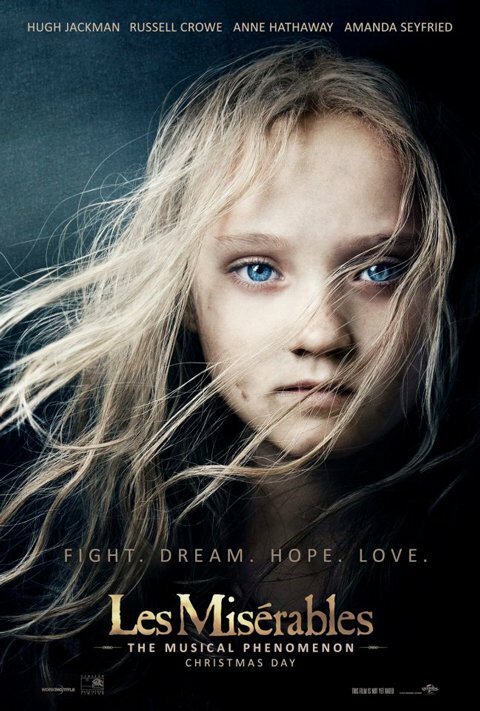 Cosette is played as an adult by Amanda Seyfried, who's name checked at the top of the poster along with the three biggest names-- Hugh Jackman (who plays the escaped convict Jean Valjean), Russell Crowe (as the dogged police inspector Javert) and Anne Hathaway, who plays Cosette's doomed mother Fantine. Rounding out the cast are familiar names, like Helen Bonham Carter and Sacha Baron Cohen, plus up-and-comers like Eddie Redmayne and Broadway veteran Aaron Tveit. The biggest name of all, though, might be Tom Hooper, who directed The King's Speech and won a whole slew of Oscars just two years ago, and is making Les Miserables as his third feature ever. Going back to those unconventional choices I mentioned at the top… a recent featurette about the film revealed that the film's songs are being sung live on the set, as opposed to in most movie musicals where the songs are pre-recorded and the actors simply lip synch in front of the camera. That allows for the performances to be more naturalistic and for the songs themselves to sound a lot less polished-- which could require a lot of adjusting for musical fans, but could also allow a lot of people who don't normally love big flashy musicals to get engaged in the story. Les Miserables is set for release on December 25, which gives you just a few months to decide if this unconventional approach has you on board.